As you can imagine, when a garden is neglected for a significant length of time, some of the weeds take on gigantic proportions. Especially on a psychological level, it helps quite a bit to pull these up all over the garden, before concentrating on any particular area. They take up so much space that the garden immediately looks better–more civilized–when they are gone. And that encourages the gardener not to give up in despair. I was particularly anxious to root up what I think of as public enemy number one: Pastinaca sativa, also known as wild parsnip. Not only does this non-native weed spread rapidly through seed dispersal (think dill or Queen Anne’s lace, both in the same family), but if you get its juice on your bare skin and the skin gets exposed to the sun, it will burn you, raising blisters and discoloring the skin for months after the blisters heal. For those of us who like big words, this process is called phytophotodermatitis. My son Lachlan and I went on a vigilante hunt this Saturday, uprooting this weed from the garden wherever we found it. Or, more accurately, I pointed, Lachlan pulled. We both dressed in long-sleeved shirts, long pants, and gloves to avoid the burns. Since it hadn’t rained all that much, we usually used a garden fork to loosen the roots before pulling. Like a lot of biennials, it’s a pretty small plant the first year and shoots up dramatically the second year. I had tried to pull all the small plants I could find last fall, but I obviously had missed quite a few, which were now blooming for all they were worth. 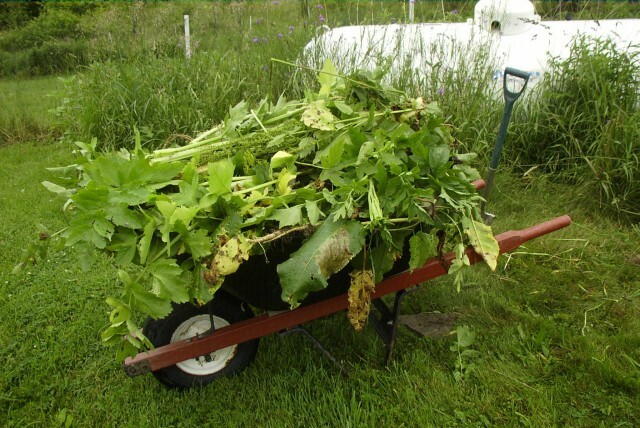 The photo above shows the first of two wheelbarrowfuls we collected. I also had Lachlan pull up all the dock (Rumex obtusifolius) we came across, even though we both knew it would be a futile effort in terms of permanent eradication. Unless the soil is extremely loose, which is not likely with our clay, I have never pulled up a mature dock plant unless the soil was saturated, which normally only happens during late mud season, when the ground is finally thawed but still full of the recently melted snow. Even so, they were big plants full of almost ripe seed and it was good to be rid of them. Alas, the same is true here with knapweed. In dispair and glee I am going to mow the yard with the tractor tomorrow (brushmower) as my lawnmower won’t start and the lovely rain has made lovely weeds. At least, I’m sure they think so. I had the weed patch up by the road sprayed but it is too dicey here around the gardens to do so. It’s time to thistle, too, but that will have to wait until Sunday or so; they’re not blooming yet anyway.